Designing a peaceful nature retreat in your own backyard may seem like a challenge if your space has more shaded areas than not. Beautifying your shaded areas does not have to be deprived of splashes of color amongst its trees if you select shade-loving ornamental trees for your garden. A few small tree varieties are well suited to grow in the shade. A member of the Cornaceae, or dogwood, family, alternateleaf dogwood, or padoga dogwood (Cornus alternifolia), is a native deciduous perennial tree that grows throughout the eastern half of North America. It grows in the spring and summer in shaded areas and in moist to semi-dry soils, and its white flowers bloom in mid spring. The tree grows in an erect, multi-stem fashion and reaches up to 25 feet at mature height. In the fall, the tree's leaves turn red before falling, giving the tree a beautiful, fall season appearance. Hardy to USDA zones 3 to 9, the fringe tree (Chionanthus viginicus) is a shade-loving deciduous perennial tree that belongs to the Oleaceae, or olive, family. The fringe tree is native to the eastern region of the United States and grows to 20 feet in height with a 20-foot spread. Its soft white blossoms have long, slender fragrant drooping petals that form on the tree from late spring through early summer. Its dark blue fruit forms on the tree in late summer and are a feast for the birds. In the fall, its leaves turn a showy yellow color before falling. 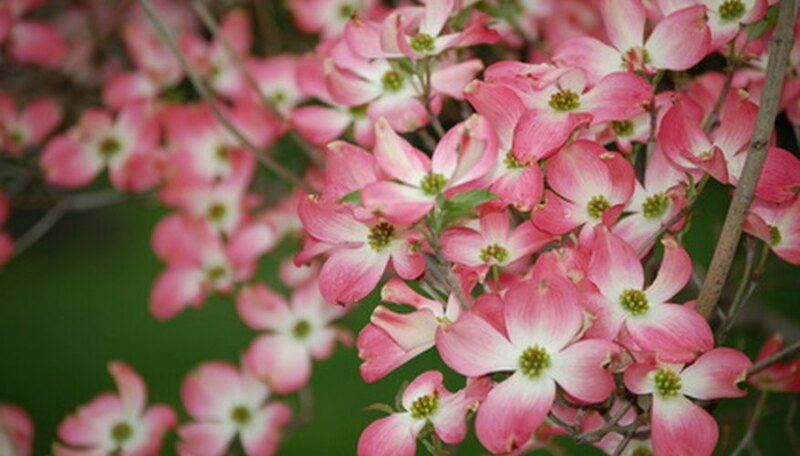 A deciduous perennial tree of the Cornaceae, or dogwood, family, that grows in the eastern part of the United States, Kousa dogwood is a shade-loving deciduous perennial tree that grows in partial shade to full sun exposure. The tree grows up to 30 feet in height with a 20-foot-wide spread. Its ornamental white or pink flowers bloom in the spring, and its pinkish or reddish fruit develop on the tree in late summer. In the fall, the tree's dark green leaves turn shades of red and purple before falling. This member of the Fabaceae (bean or pea) family is native to the central and eastern regions of the United States. Eastern redbud (Cercis canadensis) is a perennial deciduous tree that grows in partial shade to full sun exposure and well-drained but moist soils. The tree grows in the spring through summer seasons, reaching up to 30 feet in height. Its abundant vibrant pink flowers bloom in the spring, covering every stem and creating a bold splash of color in the garden. In the fall, its leaves turn yellow before falling.